A popular choice among horse owners is a fly control product call Pyranha Wip N’ Spray. Not only does it protect your horse with just 2 ounces per head, it also leaves your horse with a very shiny coat. 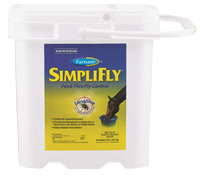 Feed-Through Natural Repellents – Start your horses on Farnam SimpliFly Feed-Thru Fly Control now and continue throughout the summer until cold weather restricts fly activity. This effective method of managing stable and house flies kills larvae in the manure and prevents their development into mature adults. It’s highly successful when used in conjunction with premise sprays and sticky tapes. 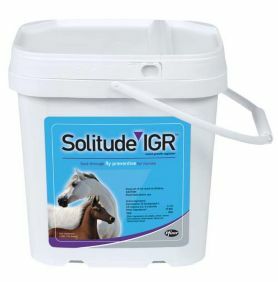 SimpliFly contains no organophosphates and is highly palatable, just add to feed.Solitude IGR is a safe, feed-through fly control product containing cyromazine. Though not an organophosphate, cyromazine is an insect growth regulator that safely and dramatically reduces the number of house and stable flies by preventing immature flies from developing into adults.Fly Repellent – Spray your livestock daily, especially after you bathe or rinse your animal. Make sure you remove excess water after bathing before spraying fly repellent. Fly Masks & Sheets – Great for keeping the flies from aggravating their ears and eyes (especially if they are goopy). Fly sheets are also beneficial to keep the flies from biting around their shoulders and neck. Smith Farm Supply has a variety of fly control products and supplements to help you keep your animals healthy and happy this summer! This entry was posted on Sunday, March 18th, 2018 at 7:48 pm	and is filed under Horse, News & Update. You can follow any responses to this entry through the RSS 2.0 feed. Both comments and pings are currently closed.